Headlamp bulb twin filament 6 volt 32-50w. Pre-focus style 6v headlamp bulb 6 for the 1935 - 1939 American Ford V8. Quartz Headlamp bulbs 6 volt. Replacement quartz bulbs for your headlights if you have converted them over to accept quartz bulbs. Single filament 6v LED bulb for brake light or indicator. (An electronic flasher unit may be required, if used for indicators). 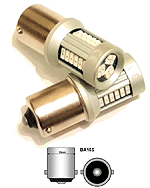 This warm white led bulb is super bright and works great through a red or amber lens. Fits the regular bulb holder. Sold each. A great upgrade! (Positive or Negative Earth). Single filament positive earth 6v amber LED bulb for indicator use. (An electronic flasher unit may be required). This amber led bulb is super bright and works great as an indicator, through a clear lens. Single filament 6v LED bulb for side light or tail light. This warm white led bulb is super bright and works great through a red lens. Twin filament 6v positive earth LED bulb for the stop and tail light. Fits the regular twin fillament stagered pin bulb holder. Sold each. A great upgrade! Positive Earth only. 6v Bulb for the Tail, lamp, or the dash. 6 volt 5w. Single filament bulb, small head. 6 Volt 21w/5w Stop and tail bulb. Twin filament bulb with offset pins. (Large Head). 6v twin fillament 21w/5w bulb, ideal for use as stop and tail light bulb. Has the smaller head where space is tight. 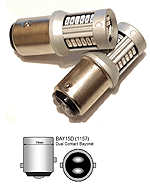 Offset pins, as used in our cowl light turn signal kit. Stop light bulb 6 volt 21 candle power. Single filament bulb. (Large Head). Stop light bulb 6 volt 32 candle power. These are a brighter version, ideal for indicators. Spare 6v Pilot Bulb for the A-13310-USA turn signal kit. 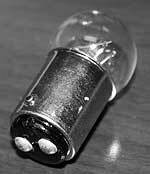 6volt, 3 watt Ba9s style bulb.